It happened suddenly, as many accidents often do. Two kayak fishermen were anchored next to each other just off the main current outside Fletcher’s Cove fishing for shad on a cool, overcast April morning. Suddenly one of them tumbled off his boat and into the muddy water of the surging Potomac River. The current pulled him away from his kayak so he began swimming for shore as his buddy frantically tried to clear away the anchor lines so he could help his friend. I was fishing for shad from shore, again, near the makeshift boat-canoe-kayak, spey casting, shore fishing area above the half-drowned picnic table. 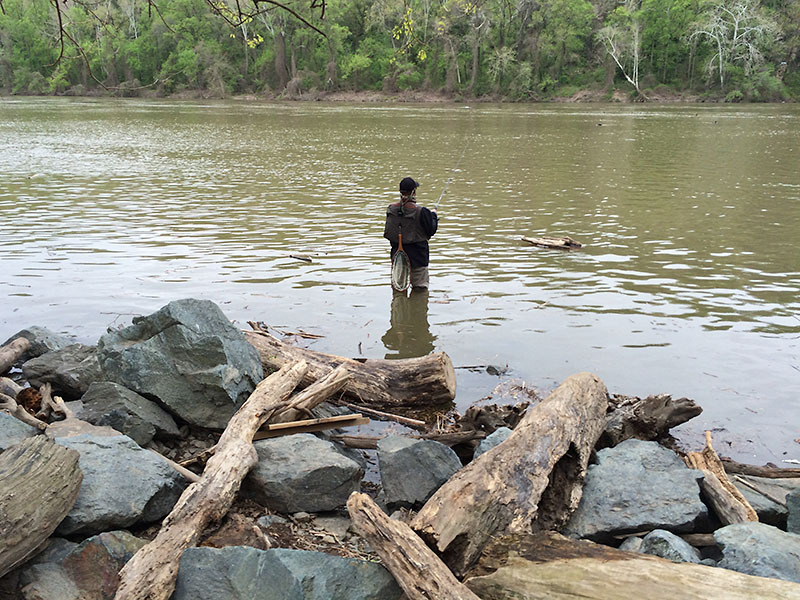 The folks at Fletcher’s Boathouse were not renting rowboats today, the Potomac River was still running too high after a big rainstorm a few days ago, so I hauled out my Shimano 11-foot 6-inch spinning rod and a box of shad flies and attempted to hook a few shad. The water was still pretty colored from the recent rain but there were a few private watercraft anchored off the main current. Several kayak fishermen and a couple of bass boats formed a ragged line just outside Fletcher’s Cove, the anglers armed with an assortment of spinning and fly rods. I had hooked three fish and was retying my leader--lost the shad and most of my terminal rig when the fish wrapped itself around a drifting log--when I happened to glance towards the boats and saw a head sticking up above the water. It was a person swimming for shore. He was attempting to swim with a paddle in one hand, so I guessed that one of the kayak fishermen had taken a tumble into the water and could not get back to his boat. His buddy was hauling on the anchor line in an attempt to free his craft so he could go help his friend. Meanwhile one of the bass boats pulled their anchor and motored over to the swimming angler and pulled him in. As they headed for the dock at Fletcher’s Cove the other kayaker, who had freed the anchors on both boats, was paddling over to the makeshift launch point with the other boat in tow. I met him at the water’s edge and helped him carry both kayaks to the grassy area above the beach. He told me he didn’t know how his friend wound up in the water--one minute he was sitting in the kayak fishing then suddenly he was in the Potomac and swimming for shore. Later I found out a sudden current surge jerked the kayak against the anchor rope, spilling the angler into the river. I fished for a little while longer, dredging out several huge snags of monofilament, but finally called it a day when it began to rain. EQUIPMENT: I used a Shimano 11-foot 6-inch spinning rod, high speed reel and a variety of shad flies. DIRECTIONS: Fletcher's Boat House is located on the Potomac River in Washington, DC, two miles north of Key Bridge and one mile south of Chain Bridge, at the intersection of Reservoir Road and Canal Road. You will know you have reached the entrance to Fletcher's when you see the Abner Cloud House, an old white stone building, which is next to the canal, and will appear on your left if you approach the area from Key Bridge or on your right from Chain Bridge. WARNING: The entrance to Fletcher’s Cove is a very narrow ramp that can accommodate only ONE car at a time so be very careful. It is also very easy to drive past the Abner Cloud House, so be alert. And it is REALLY difficult to negotiate this ramp if you approach Fletcher’s Cove via Chain Bridge because the entry ramp faces Key Bridge. There is NO RAMP facing Chain Bridge. Park in the upper lot on your left or go through the tiny tunnel (if you have anything on roof racks, I suggest checking the tunnel height BEFORE entering) to the lower parking lot and dock access. During shad season the boat rental office opens at 7am, but when the season is hot and heavy they do open earlier. Boat rental fee, plus tax, is $26 for the day. You need a D.C. fishing license ($10 DC resident and $13 non-resident) to fish and you can get them at the Fletcher's rental kiosk along with fishing equipment, bait, shad darts and flies, hot dogs, drinks, snacks and ice cream.